Roman politician Marcus Tullius Cicero was beheaded brutally in 43BC. First his throat was slit, then it took three blows to cut off his head with a sword - wielded by a soldier who had never beheaded anybody before. In fact, historians claim it's a miracle hundreds of the famed orator's letters and speeches still exist, given that he had so many enemies. Cicero was brutally killed on the orders of political rival Mark Antony. You may not realise it, but we've all heard, and possibly quoted, the ancient statesman. "During war, laws are silent." His reputation began when, as a lawyer, he demonstrated the remarkable ability to wield Latin, using his words as a weapon in the courthouse. He was later credited with the construction of how Latin was spoken and his techniques were mimicked by others wishing to master the language. In those days, the ability to write and speak Latin had much to do with raising a man's social standing. As a consul, Cicero managed to defuse a conspiracy plot by senator Catiline, who planned to overthrow the Republic. But, when Cicero approved the execution of the main conspirators, he breached a Roman law - that he sent Catiline's allies to death without a trial. According to Roman historian Appian of Alexandria, Cicero continued to oppose Caesar's attempts to form a new Roman government. Out of exile, Cicero decided to align himself with Pompey, even though he had no real allegiance to him. Appian believed Cicero deliberately sided with the team he knew would lose. 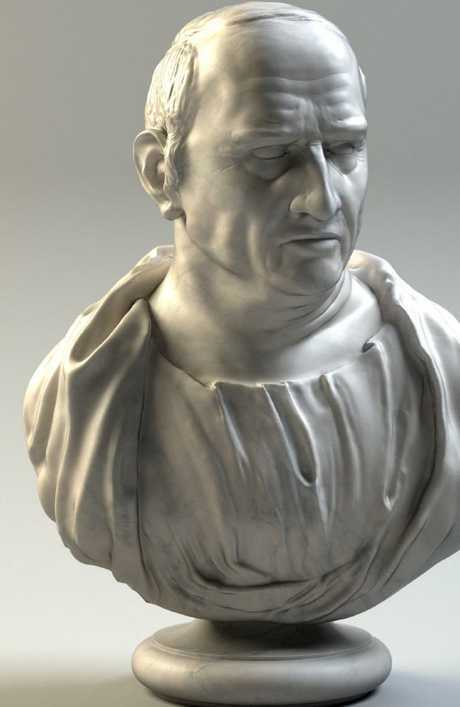 A marble bust of Marcus Tullius Cicero. When Pompey's army was defeated by Caesar at Pharsalus in Greece in 48BC, Cicero assumed he would be sent to exile once again. Instead, he received Caesar's pardon. The aftermath of Caesar's death saw years of infighting, during which time Cicero attempted to align with Mark Antony before he eventually denounced him before the Senate in a series of cutting speeches. Anthony Everitt, historian and author of Cicero: The Life And Times Of Rome's Greatest Politician, has written about a heated attack by Cicero against Mark Antony - denouncing him as a public enemy. "Cicero opened the debate at an unusually well-attended meeting with a powerful address, his third philippic. 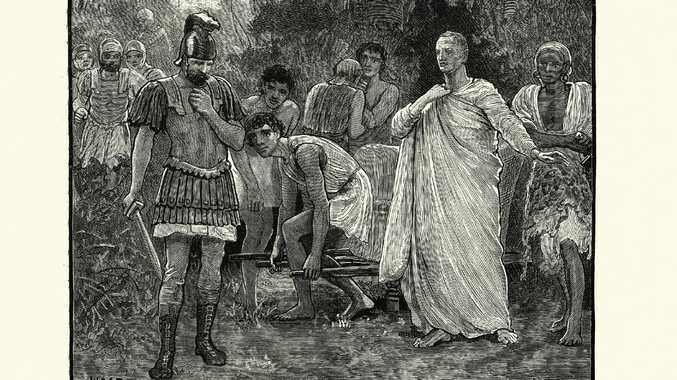 He sought to demonstrate that Antony was an enemy of the state (arguably a treasonable assertion, bearing in mind that he was still consul, if only for a few more days)." According to Everitt, it wasn't long before Antony declared Cicero a public enemy. Cicero was put on a special list of people targeted for execution, along with his brother, son, nephew and a handful of friends. 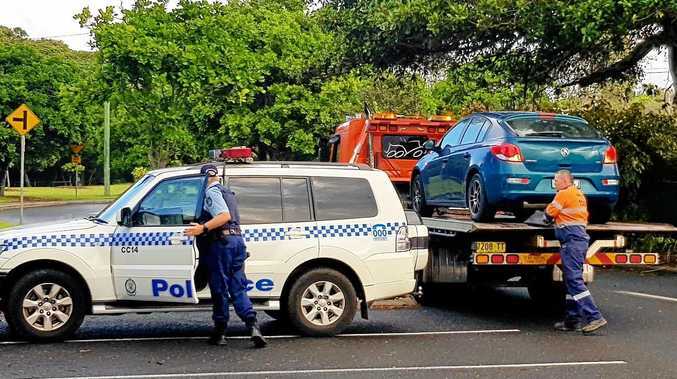 He went into hiding and the public was encouraged to help hunt him down. However, he had a lot of public sympathy and many refused to reveal whether they'd seen him. 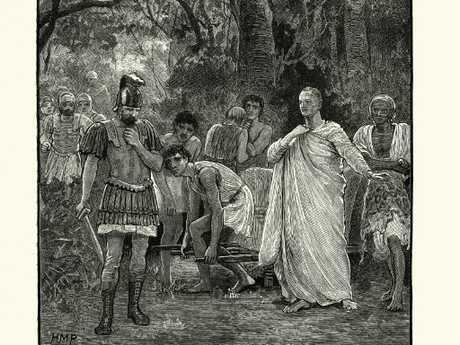 Vintage engraving of the murder of Cicero — executed by soldiers operating on behalf of the state in 43BC. On December 7, 43BC, Cicero left his country house near the Italian town of Caieta for the coast, where he planned to take a ship to Macedonia. But, according to historian Appian, two officers were hot on his heels. When they found Cicero's slaves, they refused to tell them where he was but they managed to get the information from one of his brother's freedmen (a worker who was not a slave). When Cicero and his men reached the coast, the sea was said to be too rough for travelling and they returned to dry land, lying low. That's how the killers eventually caught him. Plutarch wrote: "He looked steadfastly upon his murderers, his person covered with dust, his beard and hair untrimmed, and his face worn with his troubles." Cicero reportedly said to one of the soldiers sent to kill him: "There is nothing proper about what you are doing, soldier, but do try to kill me properly." He then leaned out of his litter (a portable bed/couch) to give them a clear stroke. However, if we read the description historian Appian wrote, the beheading didn't go very smoothly. "The attendants were terror-struck, thinking that more soldiers were coming, and Laenas, who had actually once won a court case with Cicero's support, pulled his head out of the litter and proceeded to cut it off. "It took three blows and some sawing through because of his inexperience, and he also cut off the hand with which Cicero had composed the speeches against Anthony, portraying him as a despot." 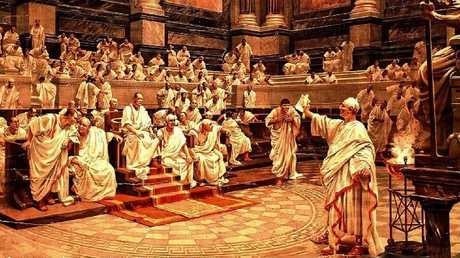 Cicero indicts Catiline before the Senate. Painting by H. Schmidt, 1920. Cicero's severed head and hands were displayed for all to see at the Roman Forum, in a bid to frighten anyone planning to oppose the new government (known as a Triumvirate) led by Octavian, Mark Antony and Lepidus. According to Plutarch, the display of Cicero's head and hands had an adverse effect on the public. The Roman people, he wrote, "believed they saw there not the face of Cicero, but the image of Antony's own soul". 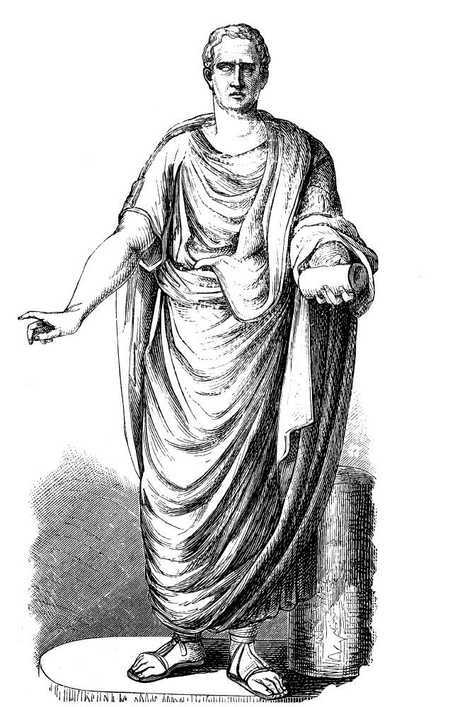 According to Everitt, Cicero was able to use his remarkable oratorical skills to argue circles around his opponents. He successfully distinguished conspiracies, he won acquittal for a man convicted of parricide, challenged the dictator Sulla with his powerful rhetoric about the decadence of Sulla's regime and wrote philosophical treatises. "Do not blame Caesar, blame the people of Rome who have rejoiced in their loss of freedom, who hail him when he speaks in the forum of more security, more living fatly at the expense of the industrious: Cicero." Indeed, Cicero's work is considered so important that, among the very first words published on a printing press, after the Gutenberg Bible, was Cicero's philosophical treatise. His huge collection of letters, speeches and writings were preserved by a man who had been a slave in Cicero's house but, though freed, continued to work for him. • Live as brave people; and if fortune is adverse, front its blows with brave hearts. • It is foolish to tear one's hair in grief, as though sorrow would be made less by baldness.